Is there room in this neighborhood for two burger contests? I guess we’ll find out soon enough. 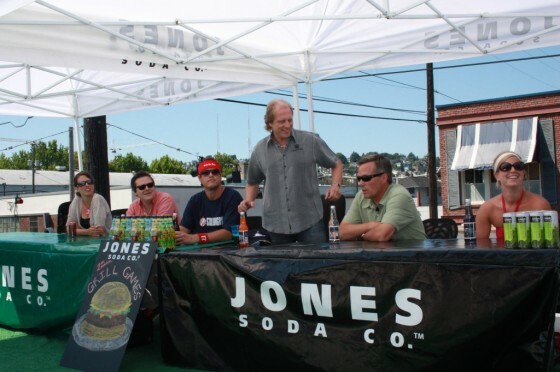 Wednesday afternoon from 3:00 – 4:00 pm on the Jones Soda Headquarters rooftop, contestants will try to create the most original and tasty burger using any Jones Soda product in their recipe. Winning recipes in the past have utilized Cola, Orange Cola, Cream Soda and Jones Naturals Limes with Orange. Participants will have 20 minutes to cook, assemble, plate and present the finished product to the judges, where Sig Hansen, Erik Denmark and Brian Canlis will be on hand to rate each burger on appearance, taste and creativity. Sig Hansen is the Seattle-based Captain of the fishing vessel Northwestern and one of the stars of the Discovery Channel series Deadliest Catch. Erik “the Red” Denmark, who resides in Seattle, is a competitive eater and a member of the International Federation of Competitive Eating. He recently placed eighth in Nathan’s Famous Fourth of July Hot Dog Eating Contest in New York City, eating 38 dogs in 10 minutes. Brian Canlis is the co-owner of the award-winning Seattle fine dining restaurant Canlis.